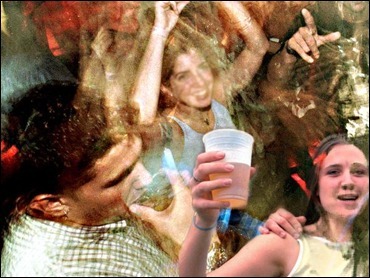 Underage drinkers account for one-fifth of the nation's alcohol consumption, a study says. Attempting to correct botched statistics they released a year ago, researchers from Columbia University's National Center on Addiction and Substance Abuse analyzed three sets of data from 1999 and said underage drinking amounted to 19.7 percent of alcohol consumed that year, or $22.5 billion. The previous estimate - now discredited - was 25 percent. Consumption by adults who downed more than two drinks daily - defined by the researchers as excessive drinking - amounted to 30.4 percent, or $34.4 billion. "These analyses show that it is not in the alcohol industry's financial interest to voluntarily enact strategies to reduce underage or adult excessive drinking," the researchers said. The Columbia center is led by Joseph Califano Jr., former U.S. secretary of health, education and welfare. The group issued a report last year saying that young people ages 12 through 20 consume 25 percent of the nation's alcohol, a figure based on the 1998 National Household Survey of Drug Abuse. Critics questioned the statistics, and Califano's group acknowledged it failed to adjust its figures to reflect teens' percentage of the nation's population. The new analysis appears in Wednesday's Journal of the American Medical Association. It included data from the 1999 version of the household survey, which involved more than 50,000 people aged 12 and older questioned at home. It also included data from two surveys of youngsters 12 and older who were questioned at school. Representatives of the alcohol industry called the new study as faulty as the old one, and questioned the researchers' definition of excessive adult drinking. The government agency that conducts the household survey, the Substance Abuse and Mental Health Services Administration, has estimated the percentage of alcohol consumed by youngsters at 11.4 percent. Califano's figure is higher because he based it on different sources, and his research seems sound, said Charles Curie, administrator of the agency. "I give them credit that they wanted to clarify the figures," Curie said.